This post is provided by App Dev Manager Dave Harrison based on an interview with Aaron Bjork, Principal Group Program Manager for VSTS (Visual Studio Team Services) at Microsoft. The following content is shared from an interview conducted in January with Aaron Bjork, Principal Group Program Manager for the VSTS (Visual Studio Team Services) product at Microsoft. Many people ask us how Microsoft accomplished our transformation with DevOps. Our interview with him opened up some valuable lessons that could be applied to any large enterprise trying to transform the way they deliver value and get feedback faster. 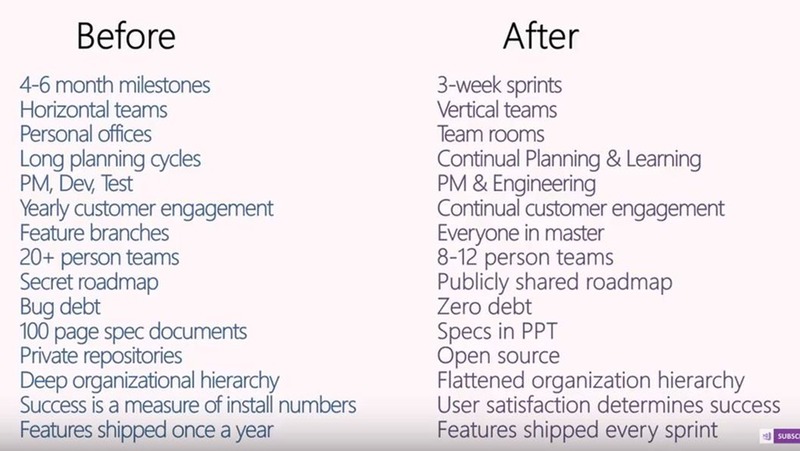 Note: if you want more on this story and how Microsoft went about their transformation, check out Aaron’s presentation here – 41 minutes that could very well change your whole view of how to go about your own transformation. It remains one of the best real-world encapsulations of DevOps that I’ve ever seen. Some more DevOps stories from the Visual Studio team are here, including our understanding of what DevOps is and Munil Shah’s excellent thoughts on “shifting Left” with our test infrastructure. These and other interviews and case studies will form the backbone of our upcoming book “Achieving DevOps” from Apress, due out in late 2018. Contact me if you’d like an advance copy!